Carol McCall’s first career began in teaching where she worked for two years in special education. She then returned to school to obtain her law degree. 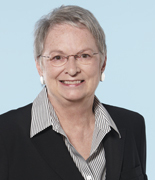 She started with Paterson, MacDougall LLP as an articling student in 1975 and then returned as an associate lawyer and is now a partner with the firm. Carol’s professional experience includes providing advice to air carriers on their operations in Canada, Canadian Transportation Agency tariffs, accessibility, licensing, operating certificates, security requirements, sales promotions, advertising, contests, employment issues, human rights, privacy and commercial services matters and applicable Canadian federal and provincial laws and international conventions. She also handles passenger injury and cargo claims; provides advice to insurers, excess insurers and reinsurers on coverage and exposure. Carol also handles fraud and fidelity losses and claims under financial institution bonds; provides advice on personal and corporate defamation; and provides assessments of liability and damages in personal injury and wrongful death claims. Carol represents clients at trials, hearings and appeals in provincial and federal courts, tribunals and the Supreme Court of Canada. Carol continues to write and present on the topics of aviation liability, regulatory issues, defamation and the assessment of damages at various professional forums.